Bajaj Auto has re-introduced the yellow colour option for the Pulsar NS200 and the shade has already arrived at the dealership. The existing colour palette includes Wild Red, Graphite Black and Mirage White. The yellow colour is seen on the headlight mask, fuel tank and on the engine cowl while the contrasting grey finish can be seen on the shrouds and the rear panel. This specific paint theme on the Bajaj NS200 was first seen at Motobike Istanbul 2018. The motorcycle features a single-channel ABS that, except for the Dominar 400, is also seen on rest of Bajaj’s product portfolio. Rear Lift-off Protection (RLP) accompanies the single-channel ABS. 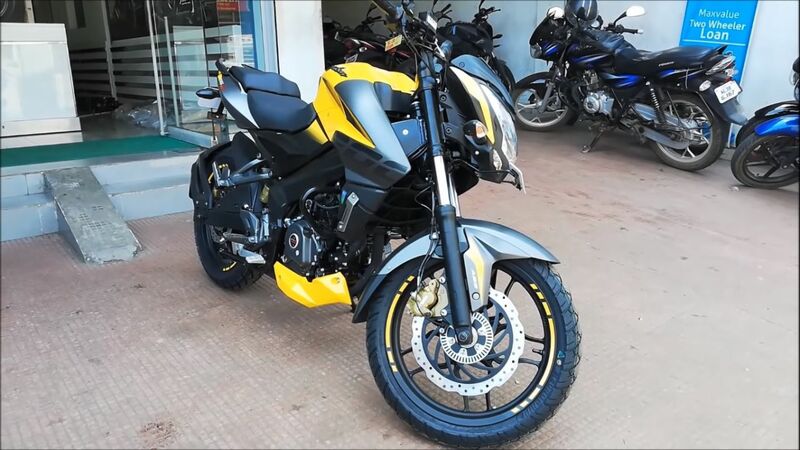 The yellow Bajaj Pulsar NS200 is available at the same prices as other colour options. Thus, the motorcycle can be purchased for INR 1.03 lakh for the non-ABS model and INR 1.12 lakh for the ABS version - (both ex-showroom Delhi prices). The motorcycle continues to use a 199.5 cc, SOHC, 4-valve engine with liquid cooling and fuel injection. The motor churns out 23.52 PS of power at 9,500 rpm, and 18.3 Nm of torque at 8,000 rpm. Mated to a 6-speed gearbox, the 199.5 cc engine can push the motorcycle to a claimed top-speed of 136 kmph. The Pulsar NS200 employs a BS-IV engine while the BS-VI motor will arrive with the updated range in 2020. A 300 mm front petal disc with single-channel ABS performs the anchoring task at the front while at the rear is a 230 mm disc. Telescopic forks with anti-friction bushing at the front and Nitrox monoshock at the rear perform shock absorption tasks. The Eurogrip sourced rubber measure 100-section at the front and 130-section at the back. In more updates from the brand, the ABS-equipped Pulsar 150 Twin Disc and Pulsar 180 have been reportedly priced at INR 87,226 and INR 92,563 (ex-showroom) respectively. The Pulsar 150 Twin Disc and Pulsar 180 had started to arrive at dealership stockyards over a month ago. Bajaj Auto has also introduced a semi-faired version of the Pulsar 180, the Pulsar 180F. The Bajaj Pulsar NS200 Yellow, which was first showcased at Motobike Istanbul 2018, has arrived at dealerships in India. The new colour option extends the colour palette to four. The Pulsar 180F looks near identical to the Pulsar 220F and comes equipped with a semi-fairing deign, vertically stacked headlight and new colour schemes. Visually, the differentiating factors between the Pulsar 180F and Pulsar 220F include the graphics and the exhaust design. Surprisingly, as we saw in the first impressions video of the Pulsar 180F from YouTube, the motorcycle is yet to receive the safety net of ABS.